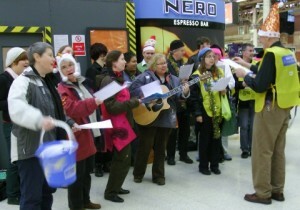 on 10 December 2009, a group of festively-minded Pinkies serenaded the commuters at Victoria station and managed to raise just under £1,000 for Marie Curie Cancer Care. We’re doing it again this year from 6 pm in Victoria station on Tuesday 14 December and, in a first for us, from 5 pm in Trafalgar Square on Wednesday 22 December and urge everyone to come join in the fun. Marie Curie works with terminally ill cancer patients, championing new ways of helping them to have compassionate and appropriate end-of-life care. The Pinkies have been doing Christmas carolling for Marie Curie for the last three years and this year we’re coming out again in support. We had a great time showing our holiday spirit in the station last year. 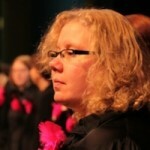 Although it was pretty cold in there, moving around, singing and wearing tinsel and Santa hats warmed us all up. Oh and we got these super duper “permission to ply your musical trade” ID badges for the day. We did a combination of Christmas carols (with some guitar accompaniment) and part of our a capella repertoire, including our awarding-winning rendition of Now is the Month of Maying. Okay, it was perhaps not a traditional Christmas offering, by hey, why not? We got a prize for it! We ended with the Pinkie traditional reward of a nice drink in the pub, a good time was had by audience and singers alike, and this year we can sing it again, all for a worthy cause. Do join us!